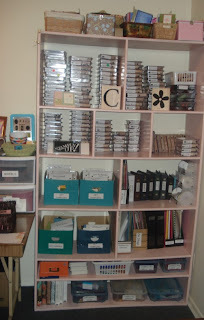 More fun on how I organize, with today's emphasis on stamp sets & card samples. 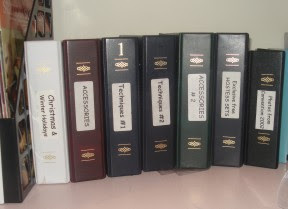 I keep all my current stamp sets & wheels here (retired ones are stored seperately) as well as the majority of my card samples. 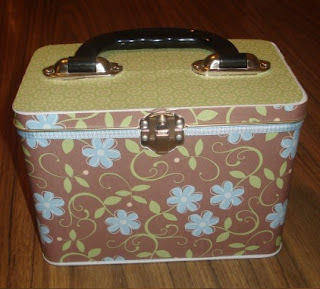 I have an identical unit that's on the left of my desk for magazines, patterned papers, scrapbooks, etc. 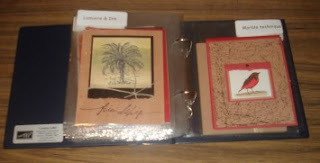 These are the little photo albums that fit 5x7 pictures. 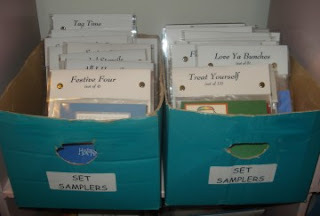 I keep albums as sample books...some show cards using specific techniques, some are for samples highlighting accessories, and some to keep seasonal cards (ex. SAB, retiring, Christmas). 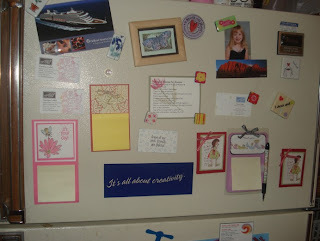 Many of you will know that I participate in lots of swaps, both the mail-in variety as well as in person like at Convention, Regionals or on the Stampin' Up! incentive cruis). 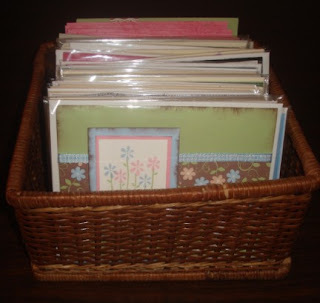 So yes, I tend to end up with lots & lots of cardfronts! When I have a good selection of a specific stamp set, I might put together a set sampler to keep them together. This helps me when I'm doing a workshop and using a set, as I can easily share some other samples using those same sets & help people see the potential of it. They're not fancy... I just print the stamp sets name on a piece of white cardstock, stamp all the pieces from the set on the back, trim it down to 6.5" x11 and then laminate it. A quick fold along the top, toss the cards in the flat large cello bags and then use the large-style brads to hold it all together. Easy peasy! There are always extra samples floating about so I keep those in small baskets, easily picked up at the local Dollar-a-ma. 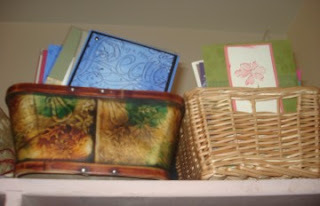 I also keep a few baskets handy that are of cards for sale. 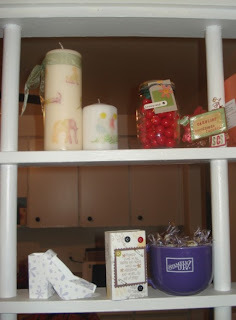 I keep them packaged in the clear translucent envelopes, along with a plain white or vanilla envelope. 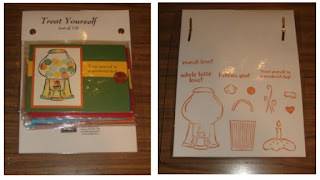 Both the card & envy tuck in really nicely, so it's a good way to package AND keep dirty fingers from ruining the cards when they're pawed at a Craft show. 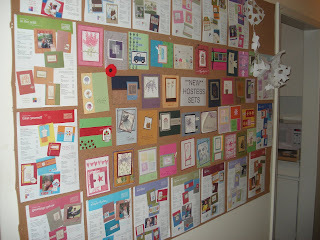 The rest of my card samples usually end up on my cork boards, and I try to rotate these every 2 months. 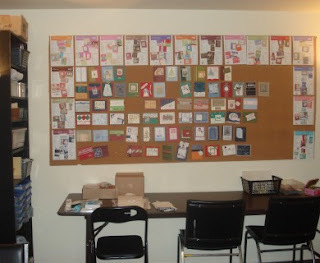 Please ignore the fact that is one of the boards is partially denuded..I've begun taking down the Christmas cards from 2006 and am preparing to put all the Sell-A-Bration samples! I have 120 that are due to arrive from the Mega-Swap I recently participated in, and I CAN'T WAIT to see them. and extras that I save to rotate out are just kept in bins. Well, that's it for today. Let's see what tomorrow brings! Wow- you've been working hard. Even though I've been to your studio a couple of times, I never really took a good look around. I'm hoping to come on Thursday night for about an hour for SAB (while my daugher is a Brownies). I'll have to have a closer look. It has been a while since we chatted and I would love to catch up again. Call me when you aren't so BUSY clean sweeping! Congrats on all the organization for the new year. I too am working on organizing my space and was inspired to step it up a notch after reading your blog. Take care my friend. 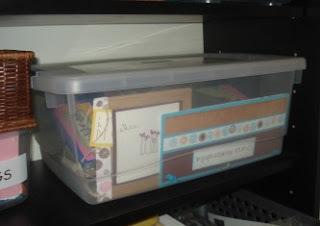 I am loving your posts on organizing! You have some wonderful ideas that I will be using. Thanks for sharing with us! Wow! Caroline, merci pour ces idées!!! Une question: avec quoi poses-tu tes cartes sur ton babillard sans les endommager??? MErci pour tous ces détails, je refile ça à ma filiation! How to you attach your cards to the cork? This is a great idea. I have all my stamp sets velcroed to my walls right now but plan on changing that since I have over 300 sets and need a better idea so I will have lots of free wall space soon! Thanks.